The Third Quadrant discloses the (re) integration of the world of ideas into the strong entity of a physical presence. It exhibits the possibility of a partial unity (identity), i.e. an acceptance of certain boundaries as being fixed, for the time being. The definition of limits and the application of the distinctions in a regulated interaction will lead to a new ‘understanding’: things are beginning to fit, a coherent picture emerges, and an introspective view can develop. More and more delineation contributes to an ever increasing ‘visibility’, which is all a result of one principle of being: the ultimate choice of a division within an undivided universe. The selection (in division), which has been made in an earlier stage, reached a concreteness in the Third Quadrant. Now there is space (and time) to make things stick out against the background of an environment. The limitations provide the contours of identity, and the observer can distinguish some form of intentionally. The conceptual setting of communication-partners in the Third Quadrant is characterized by two-tier thinking, with polarity and inversion as the major instruments to handle the dynamics. These two operational entities can be regarded as the local representatives of division and movement, the main component of the (two-fold) division of the primordial unity (of communication, see also p. 15). Dualism is the name of the game, either-or, with no intermediate stages. Contrariety (maximum difference) was the most popular of the four modes of opposition, because there was virtually nothing to which it could not, in principle, be applied. The contraries, as part of the operatives of the four-fold way of thinking, remained pack-and-parcel of the intellectual luggage throughout the ages. They contained the characteristics of being multi-purposed, either in a theoretical way (within a scheme of transmutations) or practical (to define identity). The Scholastic heavyweights in the twelfth and thirteenth century were familiar with both kinds of interpretations. William of Ockham (born c. 1285 – d. 1347/1349) gave a formal description in his ‘Summa totius Logicae’ (Pars I, Cap. 53: De Proprietatibus Relativorum). Fig. 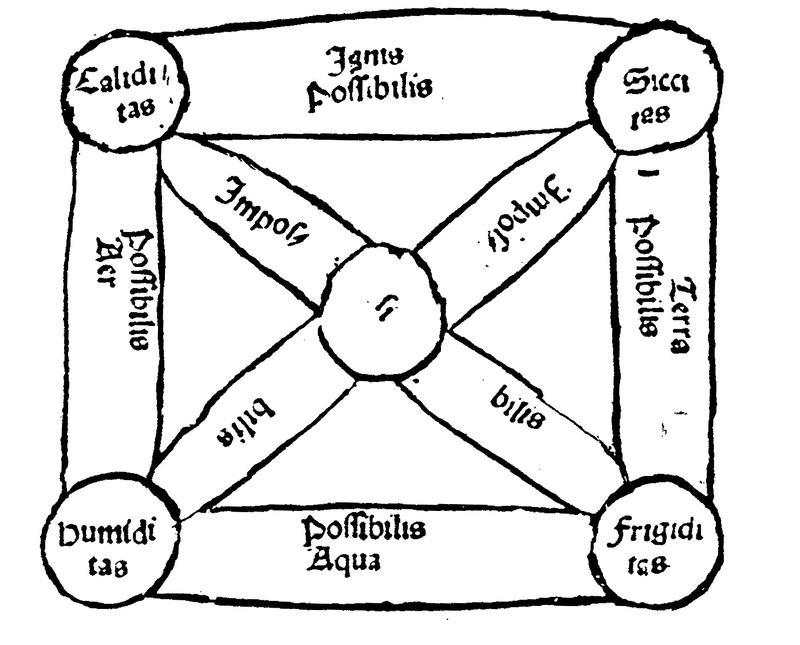 52 – The possibilities of transmutation among the four qualities (at the circles in the corners) and four elements (between the circles) from Symphorien Champier’s ‘Janua logicae et physicae’. 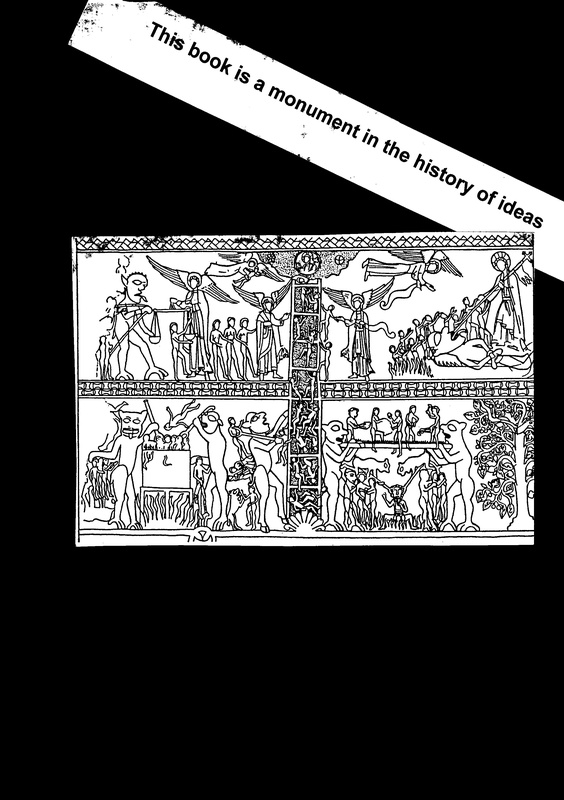 This diagram was well known and found its theoretical origin in Aristotle’s ‘De generatione et corruptione’. Some three hundred years later the scheme of correlatives and contraries was given by the Lyonnais humanist physician Symphorien Champier in his first book, the ‘Janua logicae et phisicae’ (1498), written as an introduction to Plato and Aristotle (fig. 52). The adventurous career of Symphorien Champier (c. 1472 – c. 1539) was typical for the confusion of the times. He expressed, like many of his contemporaries, a frame of mind, which was not adequately equipped to handle the great changes, which took place as a result of discoveries in the field of material (geographical) and intellectual (theological) knowledge. Champier reflected the struggle to come to terms with division thinking in some form or another in the titles of his books: ‘Libelli duo’ (1506), ‘Liber de Quadruplici vita’ (1507) and ‘De triplici disciplina’ (1509). The books themselves are a mixture of medicine, philosophy, theology and occultism and are influenced by Italian Neoplatonists, like Ficino (COPENHAVER, 1978). Symphorien Champier had the honor – according to research done by Estelle BRODMAN (1954) – to be the initiator of the science of medical bibliography with his book ‘De medicine claris scriptoribus’, published in 1506. ‘Champiers bibliography was an early attempt to respond to stress in our environment – the need to identify and organize what was published in the field of medicine’ (BRAUDE, 1996). Furthermore, he has earned himself a place as a ‘feminist forefather’ with the publication of ‘La nef des dames vertueuses’ (The Ship of Virtuous Women, 1503). A foremost characteristic of his work was the celebration of the division-as-such. The searching for bits and pieces, in a ‘stile a mosaico’, was an offshoot of the encyclopedic style, which finds its motivation in the same desire. The state of mind of the ‘mundus inversus’ can also be followed in a historical context. 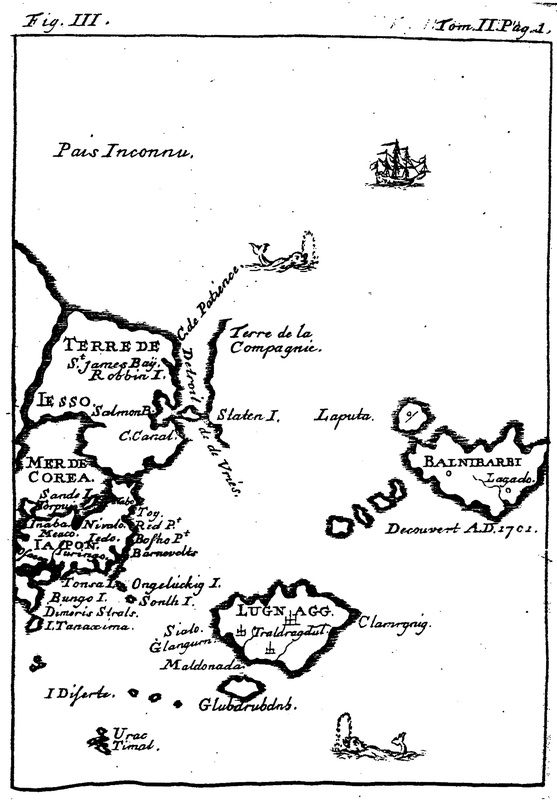 Stuart CLARK (1997; p. 35) stated that the Europeans saw things, in the sixteenth and seventeenth centuries, in terms of binary opposition and suggested that this way of thinking was one of the distinctive mental and cultural traits of the age. Creative scientist like Christiaan Huygens (1629 – 1695) and Isaac Newton (1642 – 1727) could make their enormous progress because they were able to see the Part in its own right (as a limited entity governed by oppositional forces). The long and intense debate about the nature of light as ‘particles’ or ‘waves’, which started around that time, is nothing but a struggle to understand the real character of the Third Quadrant. The controversy flared up again with the introduction of Einstein’s relativity theory at the beginning of the twentieth century. The fundamental two-division of an entity contributing to a communication in terms of a division and a movement (motion) is a reflection of the way that a communication becomes ‘visible’ in the empirical realm. If there were only a division (without movement) or a movement (without division) there would be no observable communication. The problems about the nature of (empirical) observations are typical for the nature of the Third Quadrant and for oppositional thinking in general. Paul FEYERABEND (1965) gave a challenging exposé of the doctrine of empirism and pointed to the different views towards it substantiality throughout the ages. Physical observation and careful attention have always been important issues. Myths are often built on it, because they provide the guidance through life based on previous experience gained in extended observation. Radical (or monistic) empirism, which does not accept the simultaneous use of mutually inconsistent theories, often ends up in dogmatism. Now, in Feyerabends’ view, a theoretical pluralism should be employed, even it means a partial return to Aristotelian empirism. The physical reality as described in natural science is not as straightforward as it looks, in particular, when the scale is diminished towards the size of atoms. Interaction (between the observer and the observed) becomes tricky on that level, since a phenomenon can only be regarded as an ‘observation’ when the physical interaction is described. The more we reached the last frontiers of materiality (in the form of atoms), the more the means of measuring them sits in a way. The rationalizations turn towards themselves and carry the observer back towards that same frontier of visibility. The observation implodes, leaving the observer behind in a state of confusion. The ‘individuality’ (of the observational interaction) refers to the unity of the communication. This theoretical entity is situated outside the observer’s limited point of view (as a part in the unity), but the observer is nevertheless, a part in it. Outside and inside at the same time is hard to understand in the oppositional environment (of the Third Quadrant). 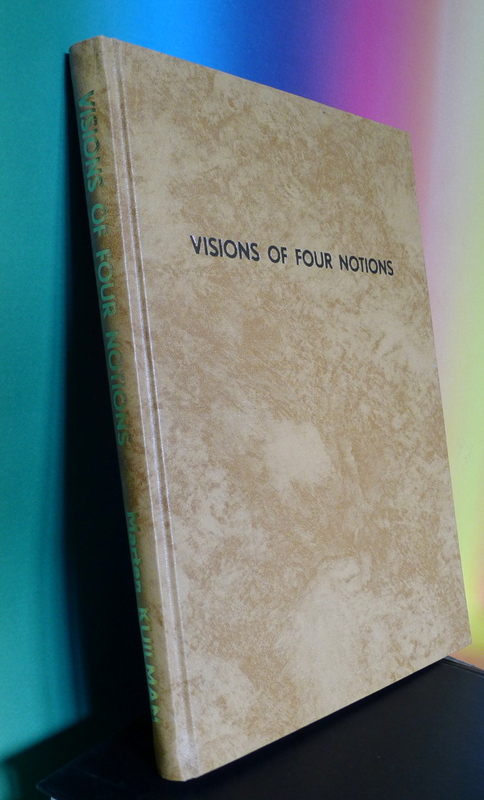 The ‘solution’ is the introduction of quadralectic thinking, which gives a separate place for the unity, both outside (First Quadrant, I) and inside (Third Quadrant, III) the physical realm of the observer. Any division of a given unity is always arbitrary, and it is better to realize that important information right from the start of a communication. So any mechanism of measuring based on a division will also be of an arbitrary nature. What the observer finally ‘sees’ (as a static part) is the result of previous choices with respect to the interaction as a whole. The actual empirical visibility constitutes of a dualistic cooperation: on the one hand, the operation of a subjective choice (of division) in the mind of the observer and, on the other hand, the division applied in the measuring instrument to come to a comparison. The various steps towards the formulation of a phenomenon may be the result of a particular choice of division, but the actual use of their outcome has a very down-to-earth nature. The act of ‘seeing’ is an empiric affair at the very moment when the ‘history’ of previous choices is forgotten and replaced by a rigid measuring system. The observer is emerged in his or her set of private standards without a hind of doubt. And any proper (scientific) measurement has to be that way: an unquestionable reality at the very moment of its consummation. The description of the (phenomenon of) interaction takes place along a floating boundary between the observing subject and the object on which attention is focused. The interaction is a dynamic process in which both communication partners apply – in their most basic form – a dual framework in the validation of the ‘shift’ between them. The last step for the observer is a liberation from the bonds of oppositional thinking, which was used for a temporary empirical clarity. Finally, the communication can be seen ‘as-a-whole’. The two dualities (from object and subject) merge into a four-fold framework. Object and subject are working together, cooperating rather than being partners in a conflict. Both provide the material for a new consensus, defined as understanding. There is, in the end and beginning, no superiority except the one defined in lower division thinking. The Third Quadrant can be, just like other quadrants, a source of wider understanding, because the primary (four) division is embedded in its apparent duality. The journey to the extreme fringes of the imagination, as undertaken by mountaineers, managers and misdemeanants alike, can only be achieved in a setting of limited division thinking. And the final success (or failure) is measured in the same terms. The vitality of an achievement is a given fact, which cannot be denied. The result of human activity can be expressed in certain terms – there are champions and winners just as lower places further down the scoring. There are also the losers, who did not reach the podium. As soon as the scope of a communication widens, in terms of higher division thinking, so dwindles the importance of the extreme performances of the participants. The accomplishments (or frustrations) receive their own place on a much larger platform of veritable emotional involvement and cannot claim a position on the center stage. Success, the top, the extreme or the limit, all measurable actualities find their merited location in the Third Quadrant. Both objective- and subjective facts cannot be denied. Yet only one step further (or back), into the adjacent quadrants, provides a different scene. Multiplicity (of ideas and/or information) has brought relativity: the top is still the top, but only at that particular place and time. There may be, on reflection, other mountains, of lesser altitude, but much more interesting to climb. The Principle of Identity requires that the object must be thought as having an immutable nature (A = A). ‘To ask why something is itself is to inquire into nothing, for the fact of the existence of something must be clear. Thus, the fact that something is itself, this is the one answer, and the one cause in all cases’ (Metaphysics, VII, 1041a 15-20). Leibniz equated the identity with truth and saw the principle as the assertion of the unity of what is different. The Principle of Non-Contradiction stated that an object cannot be thought of as having at once a certain character and not having that character (A cannot be B and not B). Without the law of Non-Contradiction there would be no distinction of any kind. This law confirms the existence of division thinking. The Principle of the Excluded Middle, where it either has that character or property or does not have it (A is either B or not B). There is nothing between Truth and Falsity. This law complements Non-Contradiction by using an exhaustive disjunction. A fourth (logic) principle, the Principle of Sufficient Reason, has later been added and elaborated by such philosophers as Leibniz, Hegel, Schopenhauer and Heidegger (among others). The first mentioning was by Anaximander of Miletus (c. 610 – c. 546 BC). He postulated the apeiron, which could explain the opposites (FREEMAN, 1999). 4. The Principle of Sufficient Reason (PSR) assumes that everything has an explanation, either in terms of the causal/creative power of something else, or in a necessity of its own nature. These three (or four) laws/principles of logic would be called collectively – and stripped of all their philosophical expansions, which have been created over the years – the principle of being. This Third-Quadrant principle comprises a full awareness of the self-itself, situated in its internal and external circumstances (which includes the compliance to the laws of logic and division). The real notion of the identity is reached here, with its roots in an immutable nature (I), the creation of a multi-divisional environment (II) and the limiting thereof to establish an elementary visibility based on opposition (III). The fourth step (to the PSR) is possibly one bridge too far, and has therefore been refuted (POST, 1987). The understanding of the (quadralectic) principle of dissociation might take its place instead. Being is a form of dissociation. The measurement of the created gap, in a quadralectic setting, means that higher CF-values indicate a higher dissociative order and consequently, a further away from the self, while lower CF-values point to a lower dissociative order and a closer to the self (or more in general: the nature of the communication).